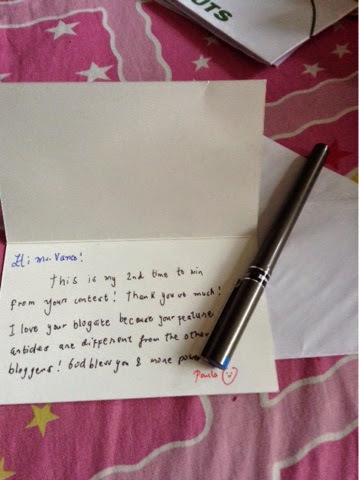 The small card that my blog reader Paula Alagao gave me and her gift pen. Before I started out blogging, I was with the print media as a freelance writer for more than a decade. I used to write regularly for a popular fashion magazine but after I had dabbled into doing other things such as television scriptwriting, I decided to stop. Of course, my colleagues from the media would agree with me that once you stop doing something you're so passionate about, including the so-called "glory-of-by-line", you'd start missing about it. And that's how I came about starting a blog. I had actually no idea what blog was all about when I started blogging four or five years ago. Sorry, I don't even hold a 'blog anniversary' like my fellow bloggers do so I'm not quite sure which year I started blogging, although I know which month. So to make the long story short, I had evolved from being a print writer to an online publisher. And I'm telling you it wasn't that easy. For one, I had received a lot of flak from other media friends. One colleague even said that I had sort of "demoted" myself. It's no secret that there are some "members of the media/practitioners" who seemed to be "narrow-minded" that they unfortunately look down on bloggers. For someone coming from media and becoming a blogger, it felt like I was in between two poles. I understand where both parties come from. I'm not being biased either because I'd rather see both media and bloggers to work hand-in-hand in informing and entertaining their readers because both have the same goal anyway. I'd rather not dwell on that as it's a very difficult topic to tackle. Going back to how I started blogging, someone suggested I start a blog or an online journal where I could bare my soul and express myself without the need for an editor. 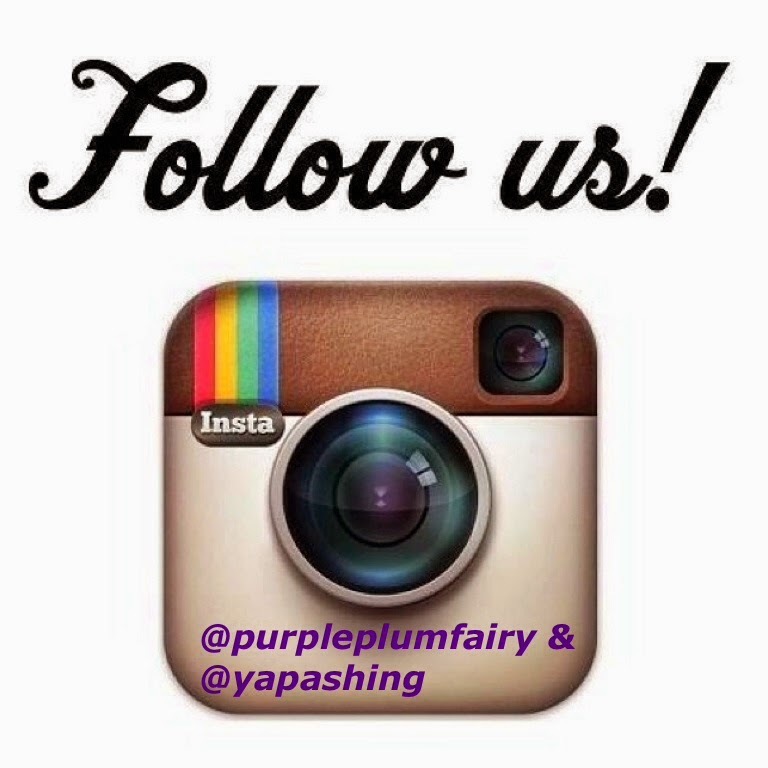 When I started with my main blog, Purple Plum Fairy, it was a Mommy blog. At the time, my nephew Kyle was still very young. He's my everything, he meant a lot to me. I was an "instant mom" when I had him under my care. My blog became my constant companion as I had struggled through all the challenges of a first time "mom". So for years, I would be writing about child-rearing and other Mommy duties I had encountered. When I would be given the chance to meet other mom bloggers at events, I would exchange mom stories with them. It was fun to meet other mom bloggers. But I had also received comments from fellow bloggers as well. However, there were some influential mom bloggers who "questioned" my "mommy blog" saying that I'm not Kyle's biological mom. I know I may only be his Aunt, but for someone who took a child from the time he was eight months-old up until now that he's 12, who fed him, changed his diapers, sent him to school and taught him everything he has learned by now--are these not enough to consider me his Mom? His biological mom (my elder sister) do not even bother to support him in any way--financially or morally in those past years. It was only me and my Mom whom Kyle can consider his family. And yet, just because I started out a parenting blog or an online journal on how I was raising my nephew as my son, I'd be receiving some "discrimination". In fact, when I asked one popular and influential mom blogger who had connections then with a toy brand and was looking for mom bloggers willing to do a product review if I could make one for my blog said, "Eh hindi ka naman mommy. This project is only exclusive for real moms." I had simply respected her decision. Perhaps my being there for my beloved Kyle all through this years may never be considered a "parenting job" for other people. I felt a sigh of relief when years of writing about Kyle and other personal stuff had slowly made my blog changed from a mom blog to a lifestyle one. At least, with lifestyle, I won't have to please other people to "accept me as Kyle's mom". My blog soon eventually evolved into a lifestyle blog. From time to time, since I got used to it, I would still be writing about Kyle and other personal matter such as this. But basically, my blog now involves a lot of other things my reader/s might be interested in. Why am I writing this post, you may ask? Let me clarify, I do not want to create an issue about my sad experience with mom bloggers here. I have long moved on, I just felt like sharing them with you to let you know that being a blogger isn't all fun, perks and freebies. Life as blogger entails hard work, intrigues and issues. But that's part of it--the same thing with showbiz and politics. Let's go back to why I am writing this post now. 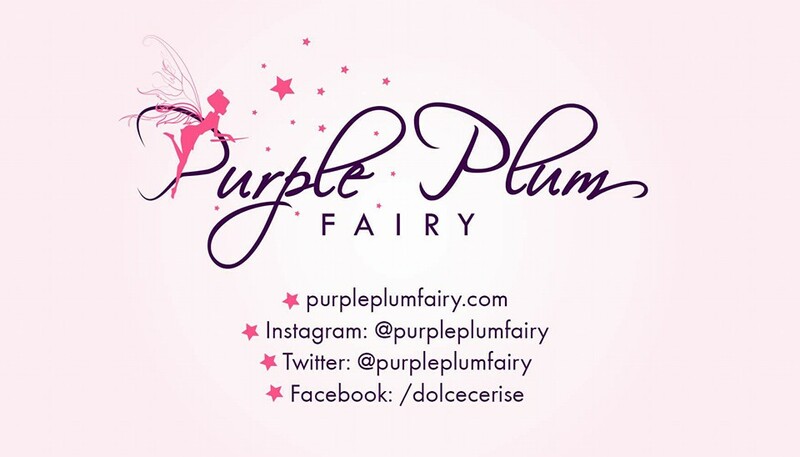 I had received a sweet surprise yesterday when I've awarded the winners to my recent blog giveaway after Purple Plum Fairy had its own domain (it can now be found under a dot com). One of the winners, Paula Alagao gave me a small card. I've met her before when she had also won in one of my past giveaways. But receiving a card from her was really something else. When she gave it to me, I held back my tears. I didn't want her or other people see some tears welling up my eyes. I didn't know someone really reads my blog. To be completely honest, I simply write what I want to write on my site. I don't know anything about SEO or blackhat and whitehat etc. in fact, another blogger once said, "Your blog's like a novel! Do you think people actually take time reading those entries of yours?" But reading a small card hand written from an actual reader of mine made me cry yesterday. It made all my blogging entries all worth it. So what if other PR wouldn't invite me on their events because I'm not fashionable/pretty enough, or because I don't have circle of friends or connections or PR ranking/hits required--for as long as I have readers who appreciate my blog in its simplicity, even if there are only few--I'd still write. 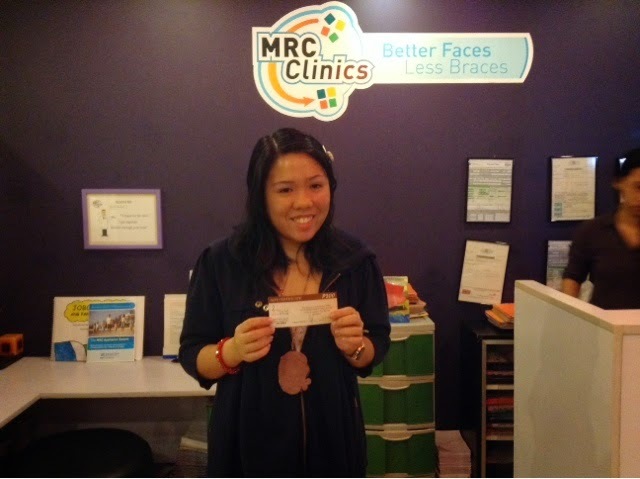 This is my blog reader Paula Alagao as she claims her Leann's gift certificate. Blogging is worth it as long as there are people like Paula Alagao--who laughs with me when I write something funny, who's like a friend I could talk to, who could learn a thing or two from my blog post--what truly matters is that I'm able to touch lives in my own little way because of my blog. To you Paula, if you're reading this, allow me to thank you from the bottom of my heart. I love the card and your pen gift. I promise to use it often. And to my other previous winner last month, (sorry your name is at the tip of my tongue at the moment), I apologize if I've had to decline to have a photo with me. I prefer that people would think I'm as slim as my Purple Plum Fairy blog logo. But I'm really grateful that you guys are following my blog. My heartfelt thanks to the ten readers (and counting...) of this blog. Seriously speaking, Thank you to all my readers. Thank you for visiting my blog, for joining my simple giveaways or contests. For bearing with my long novel-like blog entries. Thank you for believing in me. God bless you all! Rest assured, I'll try to make my blog better and more worth of your time.